It seems that London theatres cannot get enough of the ancient Greeks. Last year we were treated to a contemporary Medea at the National and a relatively classical Electra at the Old Vic. The Almeida have announced a season containing The Bakkhai, Oresteia and, tantalisingly, a chance to watch Rupert Goold direct his wife, Kate Fleetwood, in another Medea (and one would love to have Freud’s opinion on that choice!). Sandwiched between them, but certainly not squeezed out, is what can only be described as a major theatre event; Ivo van Hove – fresh off the universally acclaimed A View From The Bridge – directing Juliette Binoche in Sophocles’ Antigone. Of all the Greek tragedies it is Antigone that appears the most timeless. The moral dilemma at its heart is as immediately relevant today as it was when it was written 2500 years ago. It is a staggering achievement of simplicity and a constant reminder of the universal nature of human experience. Whilst society is broadly unrecognisable from the small slave-owning city-states of Greece in 5th century BC, the central compelling issue – of whether a person can hold a moral law above that of the state – remains at the heart of many contemporary debates. Ivo van Hove works with a minimalist’s clarity and sense of purpose to bridge a gap between the ancient and the modern. He is supported through Jan Versweyweld’s set design that splits the large Barbican space into two distinct areas. The downstage is kitted out in a sleek, functional contemporary urban style, whilst the upstage is starkly bare. Both locations give no hint to place to emphasise the universalism of the narrative. Van Hove further stresses the ageless, placeless nature of Antigone’s dilemma by projecting huge, abstract scenes onto the back wall. 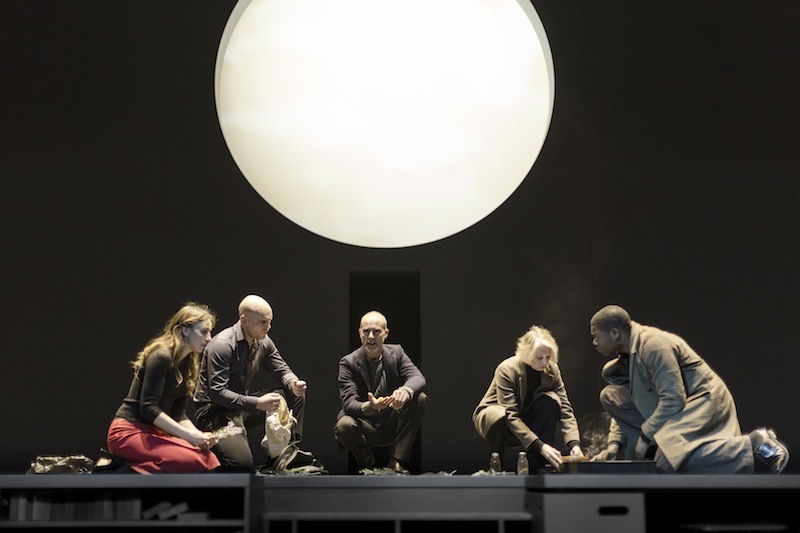 A huge circular cut-out at the start of the play gives the impression of a solar eclipse – a traditional signifier of the intervention of the gods – before slowly rolling aside to let light stream in and bath the stage in a clinical brightness. It is a production where everyone’s actions will come under the microscope and be subjected to judgement; by the gods, by the playwright and by the audience.